Module 1: What is the Anthropocene? In 1976, the scholar Raymond Williams published Keywords. The subtitle describes the book as “a vocabulary of culture and society.” Flipping through its pages, the volume reads like a dictionary. There are entries for dozens of words: “art,” “tradition,” “industry,” “violence,” etc. Below each word, he provides a bit of history about the words’ origins. But, this isn’t a typical dictionary. Williams wasn’t interested in providing definitions. Instead, he was interested in exploring ambiguities in meaning. He wanted to understand how different groups of people could use the same word to mean fundamentally different things and how those differences developed over time. Take the word “nature” for example. We all have a sense of what we mean when we say “nature,” as well as “natural” and “naturalistic.” When we try to define it for other people, however, the word becomes difficult to explain. This is because “nature” is a concept that has developed and changed over decades and centuries. It has different meanings depending on our political perspectives, religious beliefs, and cultural backgrounds. What is “natural,” and what is “unnatural?” We tend to give the word a moral sense: for example, “nature is good.” That’s why marketers tell us that our food is “all natural.” But, sometimes we talk of “nature’s wrath,” for example, when forest fires or floods affect us. What do we mean when we say “human nature?” Are humans guided by reason or emotion, or some combination of two? Is “human nature” good or is it evil? Are humans part of the “natural world” or are we something apart from it – special somehow? These are the types of questions that Williams asked in Keywords. He wasn’t interested in clarifying word meanings. Rather, he was interested in pointing out that the words we use have unstable definitions, and that some of them are particularly loaded with meaning. The “Anthropocene” is one of these words. For some, it is a scientific term, designating a measurable geological epoch. For others, it is a throwaway jargon word, bereft of any significance. For still others, it represents an ethical stance, one which recognizes the impact that humans have had on the planet and one that holds them morally accountable for it. Perhaps not surprisingly, there are many other words that are often associated with the term “Anthropocene”: “environment,” “justice,” “anthropogenic,” etc. These are themselves words whose meanings might be ambiguous or which mean different things to different people. We might think of these as “fuzzy words.” With “fuzzy words,” we have a sense of what they mean, but this meaning is often contextual—to culture, place, and time. The meanings might depend on who is using the term and the assumptions that they bring to it. Their interpretation might be contingent on their upbringing or cultural knowledge. Raymond Williams would not have encouraged us to abandon our “fuzzy words” or try to give them precise definitions. He recognized that this was impossible. Rather, Williams wrote Keywords to remind us of the ways in which our words might have unintended meanings – to encourage us to inquire about what we mean when we say something. Williams noted for us the importance of understanding what other people mean when they use a ”fuzzy word.” And, he prompted us to probe our hidden assumptions and ask ourselves why we use words in particular ways. Researchers who work in collaborative, interdisciplinary contexts – including those who work on projects related to the Anthropocene – have long recognized that “fuzzy words” can undermine their research agendas. When a word such as “resilience” goes unquestioned, researchers can end up talking past each other. One person’s idea about what is “resilient” might be fundamentally at odds with another’s notions. In the policy sector, this type of confusion can weaken effective environmental management. To address this, researchers have increasingly focused on framing “fuzzy words” (often called “boundary concepts”) within their disciplinary contexts at the outset of new projects. That way, each researcher is more aware of the ways they understand and use concepts differently. This practice helps avoid confusion and helps generate better collaborations, not just for researchers but for those who work in philantrophy, museum curation, policy making, business, and more. How then can “fuzzy words” be unpacked and meaning clearly articulated? One approach that we suggest is through concept mapping. This activity can be done alone, or it can be organized for groups as large as 70 people. demonstrate the many assumptions that we each bring to our understanding of the Anthropocene. illustrate the importance of framing concepts before embarking on interdisciplinary and collaborative work. 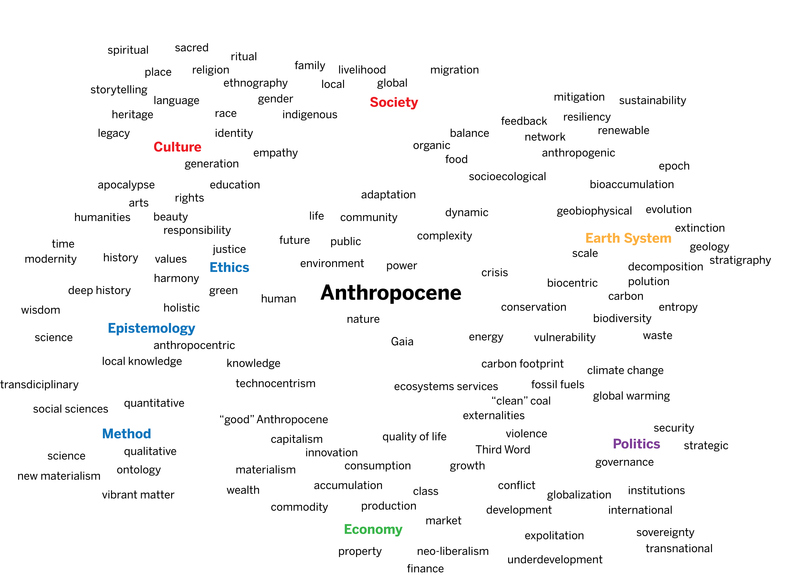 For this two-part exercise, we have created a list of “fuzzy words” related to the Anthropocene. In the first part of the exercise, we encourage you to examine these words and consider the multiple meanings that they might have. How might they be understood differently in different contexts? What is your take on the concept? How have their meanings changed over time? Given different cultural or political contexts, how might their meanings differ? How do certain definitions reflect underlying assumptions, attitudes, beliefs, and biases? In the second part of this exercise, we encourage you to relate these words to each other by creating a concept map. How does each concept inform the other? How do they build on each other? How do they add to or undermine nuanced definitions? Can you create concept clusters with the word list? Remove the list of words from the primer and separate them by cutting along the dotted lines. If you are using a digital copy of An Anthropocene Primer, you can download a .pdf of the wordlist here. Distribute the words evenly to all participants. Break participants into groups of 2-6 and ask each person to present one of their words to their group. Have group members try to identify as many meanings as possible for each of the words. Explain what a concept map is to participants. Simply put, a concept map is a visual method for representing ideas and relationships between ideas. In this exercise, we are interested in creating clusters of “fuzzy words” that relate to each other. Participants will work with each other to decide which concepts should be grouped together and why. Have participants lay out their concept map and designate core concepts around which other words can cluster. Our example provides one model for how to do this. There are many other possible variations. We have identified key concepts through color and surrounded them with “fuzzy words” that relate to the key concept. If a “fuzzy word” is related to more than one concept, we have placed it between concepts. Likewise, if “fuzzy words” related to each other, we grouped them together. Have participants explain why they chose to lay out their concept map the way they did. Us this as a chance to unpack cultural specificity and illuminate the complexity of language in the work we do. Have participants suggest other models for laying out their concept map. Ask participants how different configurations transform the way that we understand “fuzzy words”? How do they help us understand the Anthropocene? How might their concept map change by adjusting some of their assumptions and/or key framing concepts? Ask participants what new words they would you add to the concept map. How do these words help us better understand the Anthropocene? Raymond Williams, Keywords: A Vocabulary of Culture and Society, revised ed. (New York: Oxford University Press, 1985). Header video created using clips with Creative Commons 0 (CC0) licenses. Version 1.0 of An Anthropocene Primer is hosted by the IUPUI Arts and Humanities Institute as an open access book. In collaboration with Indiana University Press, we are inviting the public to participate in an open peer review of the volume between October 23, 2017 and February 1, 2018. We will revise the primer in response to the comments and intend to publish the text as an open access book as well as a hard copy volume in 2018. Proceeds from Version 2.0 of An Anthropocene Primer will be used to fund open access translations and support environmental charity work.